Since time immemorial, we have worshipped Sun as a God. Civilizations have relied upon Sun throughout history, for farming and agriculture efforts to grow crops and sustain populations. But technology improvements and innovations have helped mankind develop the ability to harness the sun’s awesome power. The resulting technologies have promising implications for the future of renewable energy and sustainability. The solar power is a virtually unlimited and inexhaustible resource (as opposed to power produced from fossil fuels) while the carbon footprint of solar power continues to diminish and the dream to go solar becomes more accessible to masses. Dantal Hydraulics Pvt. Ltd., has diversified in the business of building solutions with solar as its primary building block. There is enough solar energy available for all of us round the year. The need is to harness it for the good. Dantal SUNshine provides extensive solutions and services to make use of sunlight for regular industrial operations and activities, gradually replacing conventional fuels, conserving funds for utilization in other productive operations/expansion, accumulate wealth for you via carbon points. Hot water generation for industrial applications for use in your paint shops, drying, degreasing, heating of tanks, paint baking, cooling and refrigeration, effluent treatment, and many more. Dantal SUNshine gets into a detailed study mode to find you a customized solution that works for your organization. Dantals’ engineering team manages complete integration with your existing environment without disruptions to your core business operations. The solutions are easy to operate with no special skills to operate the new set up, seamless and produce results from the first day itself. You can monitor the progress yourself and check accruing benefits in monetary terms as days progress and you get a handsome return on your investments. The payback periods are encouraging and hold tremendous promise over years. The Chemical Industry includes basic chemicals and its products, petrochemicals, paints and varnishes, gases, fertilizers and alcohol. It is one of the most diversified of all industrial sectors covering thousands of commercial products. It plays an important role in overall development of Indian economy. It provides chemicals to various other industries such as paper, paint and textiles. The huge agricultural sector also depends heavily on the chemical industry through fertilizers. The chemical manufacturing process is quite complex due to wide variety of outputs having different properties. The typical energy intensive processes in the chemical plant are distillation, evaporation, packaging, centrifuging and drying. Heat is required in almost all forms such as low and high pressure steam, hot water and hot air. Besides heating applications, solar thermal systems can also meet cooling demands. 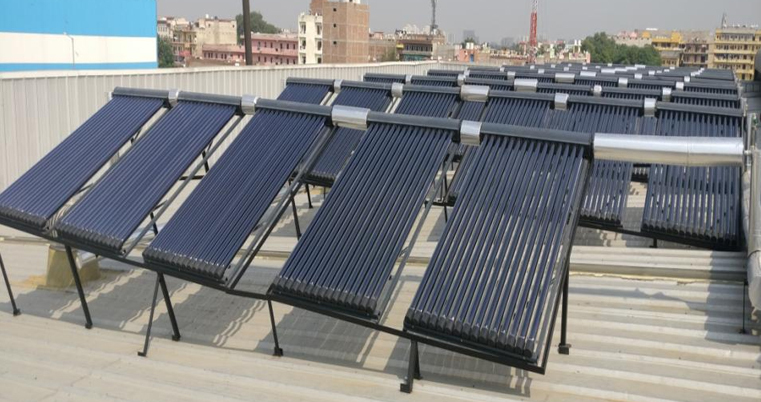 In this case, solar thermal cooling systems can be used to replace gas driven or electricity-driven absorption/adsorption chillers or to replace electricity driven, vapor-compression air conditioning systems. Absorption and adsorption chiller systems use liquid or solid refrigerants to cool the environment. In absorption chillers (the most common system), solar energy is used to regenerate the absorber fluid, which contains the refrigerant after it has been evaporated. We plan, design, and implement solar thermal energy projects - anything from large-scale municipal projects to home rooftop installations. We typically begin with a client consultation, site assessment, and financial assessment along with installation cycle. Energy Audit is the key to a systematic approach for decision-making in the area of energy management. In any industry, the three top operating expenses are often found to be energy (both electrical and thermal), labour and materials. If one were to relate to the manageability of the cost or potential cost savings in each of the above components, energy would invariably emerge as a top ranker, and thus energy management function constitutes a strategic area for cost reduction. Energy Audit will help to understand more about the ways energy and fuel are used in any industry, and help in identifying the areas where waste can occur and where scope for improvement exists. The Energy Audit would give a positive orientation to the energy cost reduction, preventive maintenance and quality control programmes which are vital for production and utility activities. We conduct such audit programmes to keep focus on variations which occur in the energy costs, availability and reliability of supply of energy, decide on appropriate energy mix, identify energy conservation technologies, retrofit for energy conservation equipment etc.